Mario Party 10 is the perfect game for keeping a group of kids occupied but, in reminding you of what made the original Wii so appealing, it inadvertently highlights the Wii U’s shortcomings. Nintendo indisputably makes some of the world's favourite games franchises, but Mario Party has never really caught the public imagination in the manner of, say, the Mario or Zelda games. Is Mario Party 10 the title to do it? Admittedly, the Mario Party series never set out to be more than something fun and frothy that could keep up to four youngsters occupied for extended periods – the very essence, in other words, of what the original Wii console was all about. It's for the kids. 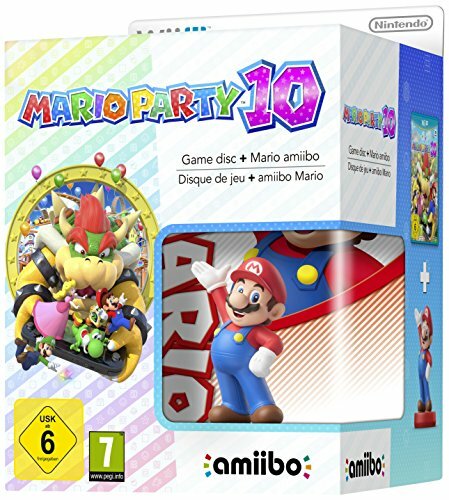 As was the case with its predecessors, Mario Party 10 is essentially a board game in digital form, which stars a large selection of Nintendo's most popular characters. It's a four-player game, but up to three can be computer-controlled. Gameplay is simple: you progress around various boards, acquiring items, and playing mini-games against each other in a quest to collect the most stars by the end of ten rounds. Which is all great fun, and there are some cute board-game-style twists, such as dice numbered from four to six or one to three (which can come in handy), plus battles against Bowser and Bowser Junior. But the mini-games, which you can play at your leisure, are very mini indeed, and it all feels a bit unsatisfying. Unless you're under 10 years old, perhaps, but even then kids know what's truly engaging. The main new feature that Mario Party 10 boasts compared to previous titles in the series is support for Nintendo's Amiibo figurines – the physical characters that can be used in conjunction with Wii U games for special features. They're essentially toys that carry some data on them which can interact with the game. We can see the collectible appeal for kids and these do indeed do bring plenty to the, erm, party. There's a whole variation on the main board game which can be triggered with an Amiibo character, and you can make up your own board for the Amiibo-specific game by slipping in quarters of the board themed on different characters, like Donkey Kong and so on. Earn tokens in each Amiibo game, which are saved to your Amiibo and can be cashed in for all sorts of perks when you play next – that's an added prerogative to play. Four people can play with an Amiibo each, too. Mario Party 10 works particularly well with the Bowser Amiibo, since he features very heavily in the game as "the bad guy". So heavily, in fact, that you can choose to play as Bowser, and against the other three participants, bringing an element of asymmetry (which is very much a gaming buzzword at the moments) to proceedings; indeed, the normal course of the main game often randomly pairs players in teams or pits one against the others. Happily, you can still play as Bowser even if you don't own a Bowser Amiibo. Mario Party 10's mini-games make good use of the Wii U Gamepad's capabilities (plus the Wiimote's motion-sensing) – you have to do things like blow into the microphone or swipe the stylus, and at least the game provides employment for Wiimotes that have done little but gather dust in recent years. When you start winning, you're awarded cash which can be used to unlock a large roster of new mini-games, new characters and the like. Mario Party 10 looks good, too, prompting you to wish that Nintendo would make it as a physical board game. But in pure gameplay terms, it is very one-paced and lacks variety, nor does it in any way hang together as properly coherent entity. Even for the Nintendo faithful, Mario Party 10 will remain a non-essential curiosity due to its lack of cohesion and clarity. It's just a bit of fun for the kids, which it succeeds at, but it's not the A-list Nintendo game the "Mario" namesake would typically suggest. However, it is a great purchase – presuming you actually own a Wii U in your household – if you have groups of kids around and would like to keep them remotely entertained for considerable periods. Each session around the virtual board takes about half an hour, and it makes great use of the Amiibo characters – if, that is, you happen to own any. If your kids are pestering for them, now you know why. What the Wii U still lacks, though, is must-have games which drive hardware sales spikes, and Mario Party 10 certainly isn't one of those. It leaves you feeling nostalgic for the days when the original Wii introduced the joys of gaming to a whole generation of non-gamers.